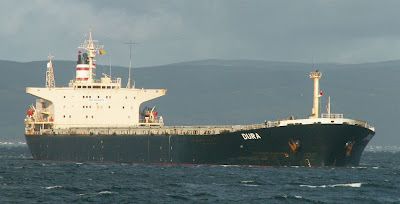 Another picture kindly supplied by a good friend shows the bulk carrier DURA arriving at Hunterston yesterday. This ship was built by Mitsui Engineering & Shipbuilding at Tamano in Japan, and was launched in October 1981 as MAYASAN MARU. With a deadweight tonnage of 105,496 tonnes, she is 249.8 metres long. In 1997, she was renamed BRILLIANT CORNERS, and became DURA in February this year. A Capesize bulker, she is now operated by Johann M K Blumenthal, one of Germany's old established shipping companies, and flies the Maltese flag. Great pictures, was this one taken from largs?